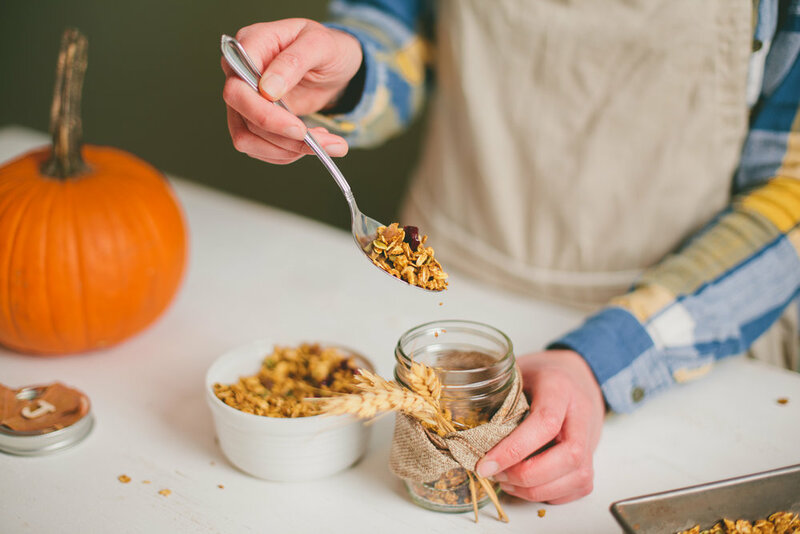 Enjoy this easy-to-make crunchy treat filled with flavors of the season. Sprinkle over yogurt, ice cream, bring on a hike or fill up your cereal bowl and enjoy with milk in the morning! Preheat oven to 325 degrees. Line a baking sheet with parchment paper, set aside. In a large bowl, combine the first five ingredients and set aside. Mix the next five ingredients together and pour into dry ingredients. Mix well, until the oatmeal mixture is nice and moist. Spread the granola on to baking sheet and bake for 20 minutes. Remove from oven and stir the granola. Continue cooking for an additional 15-20 minutes. Remove from oven and add pepitas, dried cranberries and dried chopped figs.